Upright Channel Park is yours to enjoy roughly half a mile down Military Road from the property and then a short walk through the park to this beautiful beach. 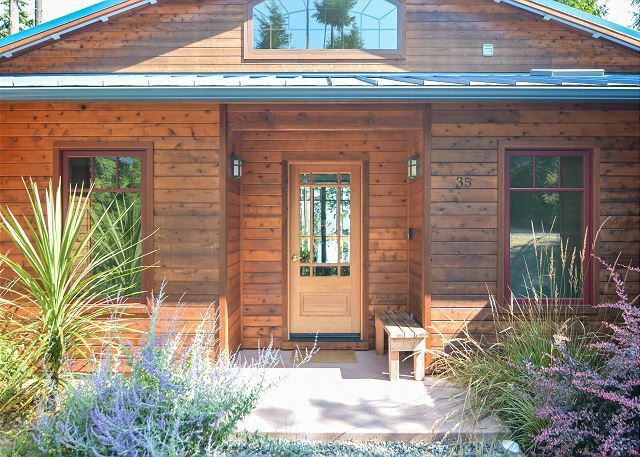 The owners of Raven Rock have completed the construction and furnishing of their dream vacation home on Lopez Island and it is now ready for your family to enjoy. You will find this lovely waterfront home tucked away down a country lane, surrounded by natural landscape and a grassy lawn at the bluff over the shoreline. 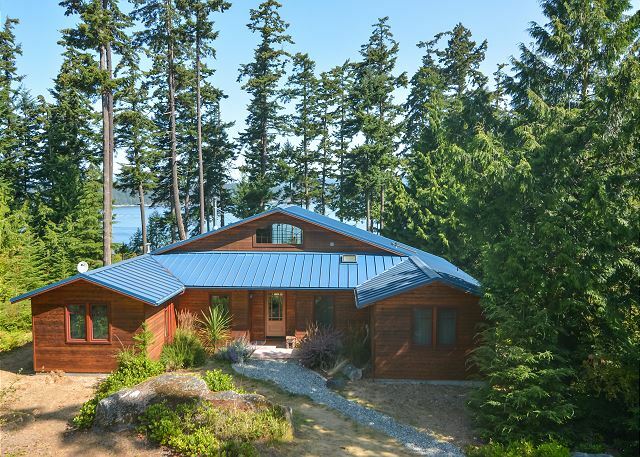 Built in the midst of a sunny five acre property, the home offers a sparkling blue water view that can be fully enjoyed from the large deck on the waterside. The beach below the bluff adjoins one of the most beautiful stretches of sand on the Island, Beach access is approximate 1/2 mile down Military Road to Upright Channel State Park. Once at the park, It is a short, down a beautiful wooded trail to access this lovely picnic and sunbathing spot. Despite the elegance of a sandstone tiled entry and gleaming Brazilian Koa floors in the great room, the atmosphere is that of a casual island residence. 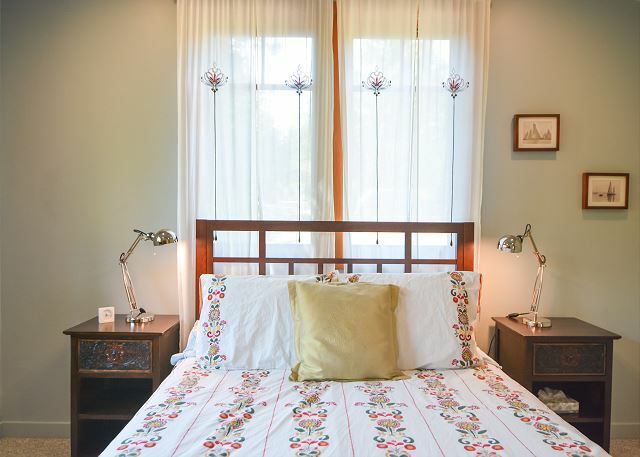 Everything is new, yet there is a flavor of vintage in the mix of materials and furnishings. 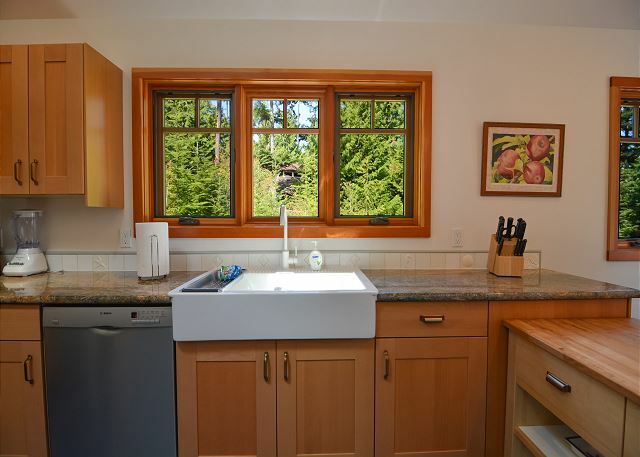 The spacious kitchen features high end appliances and a farmhouse sink. To make meal preparation a joy, there is a dining table with seating for up to 8. 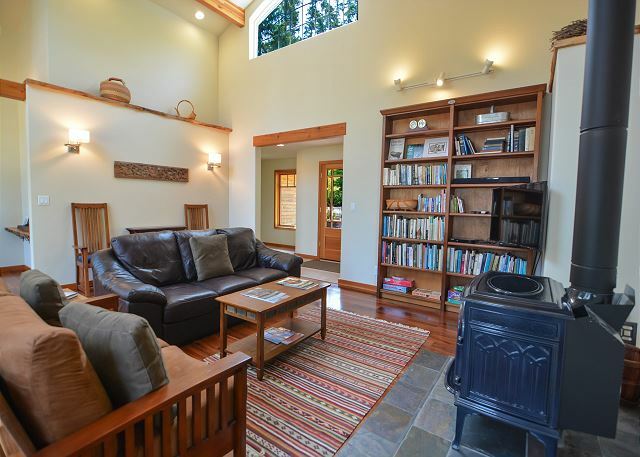 The living room offers a cozy wood stove, TV, and an alcove with a comfy window seat that beckons one to curl up with a book. With three bedrooms and two baths, the home works well for various guest configurations. The master bedroom offers a queen size bed and en-suite bath. 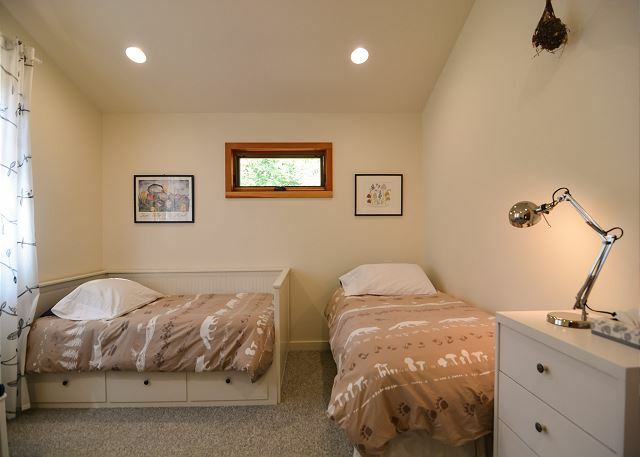 A second bedroom also offers a queen bed, and the third bedroom is outfitted with two twin beds. A bathroom in the hall services the second two bedrooms. 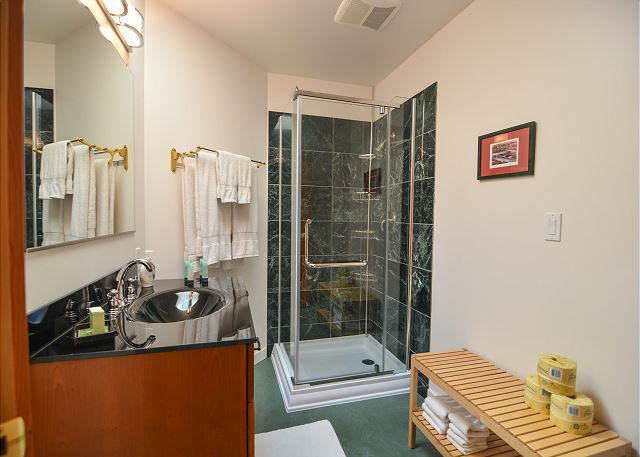 Both bathrooms feature walk in showers, tiled surrounds, and painted ceramic sinks. Rented Raven Rock with another couple and it was a wonderful place for all of us! The back deck was a perfect place to see ferries and boats go by AND for seeing the Milky Way on a clear night, the rooms were great and the kitchen is roomy and really nice for preparing some meals at "home". Highly recommend! Beautiful, clean and cozy home. Great location close to town. It was a beautiful home. We did have ants mostly in one bedroom but few scattered in other areas. Management came out to correct it. Perfect home for four adults and two children. Great water views, quiet, exceptionally clean vacation home. Time after time, we've enjoyed staying at Raven Rock. We continue to see small improvements to this already beautiful home. We might have left a few beach treasures on the front steps. Enjoyed the rental and the experience went without a hitch. The house is beautiful and peaceful. We watched ferries come in and out from house. The island is slow paced and friendly. Great place to relax. This was our 2nd year in this home which is lovely and well kept. 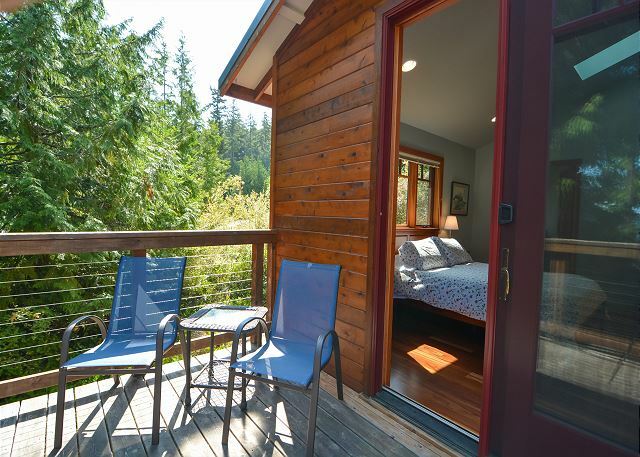 Perfect for 2 couples and great location. New (more) pots and pans would be helpful in the kitchen. We would definitely stay here again. Really lovely house, very open and comfortable with a great big kitchen and lots of light! We enjoyed the house very much and found it very comfortable! Also the property management company was extremely nice and helpful and very accommodating - thank you! We were blown away by the views on entering the home. Went out on the deck to take it all in and a bald eagle landed in the tree nearby. This home is immaculate and comfortable. We had a perfectly delightful time. It was a short drive to the ferry and to town, yet in a very secluded setting. Perfect...Thank You! Raven Rock was a much nicer home than the pictures show. It was light airy and tranquil. We appreciated knowing ahead of time that the location was best for adults. We especially enjoyed the deck and hikes in the area.The kitchen was one for a gourmet . We cooked most of our meals at site and found cooking aids in abundance. The home was beautiful and the views were spectacular. The house was well stocked with plenty of towels and blankets and kitchen items. 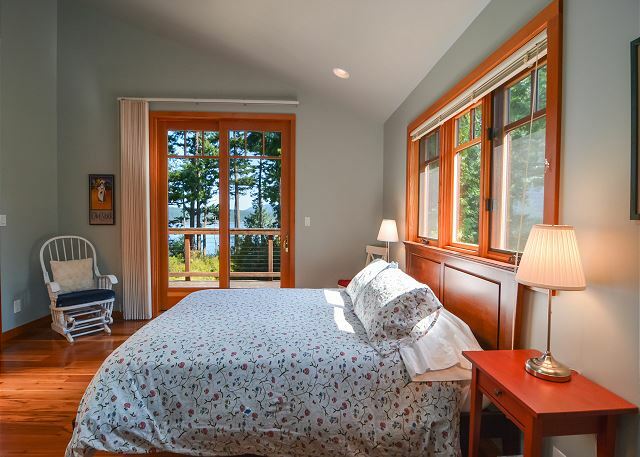 The picture windows framed the trees and ocean like art work. We even saw eagles from the deck. The management company was very friendly and made sure our stay was nothing but perfect!! We didn't want to leave!! a beautiful secluded home overlooking the water. deer, balk eagles, golden eagles, flickers, and herons. This is our second stay at this beautiful home and not only is it beautifully furnished, it has a great view and is comfy. The home was beautiful. The island made you slow down and relax. You can watch the ocean all day and ships/boats go by. You can not get to the water from the house but less then half a mile away is an entrance to a beautiful sandy beach with lots of drift wood. Everything was perfect. 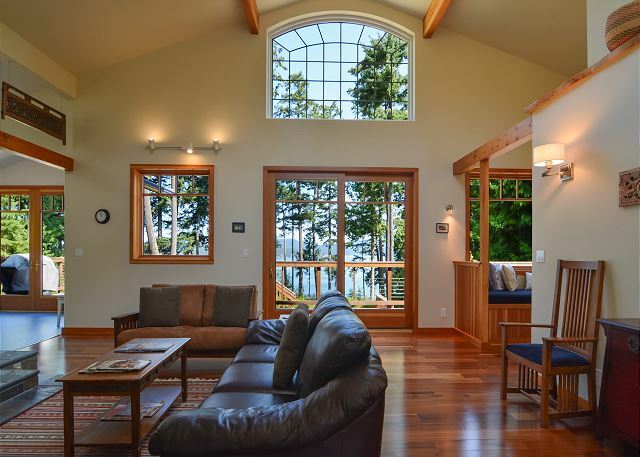 The photographs don't do justice to this beautiful home - when you walk in the door and see the high ceilings and incredible view, you know it is something special. 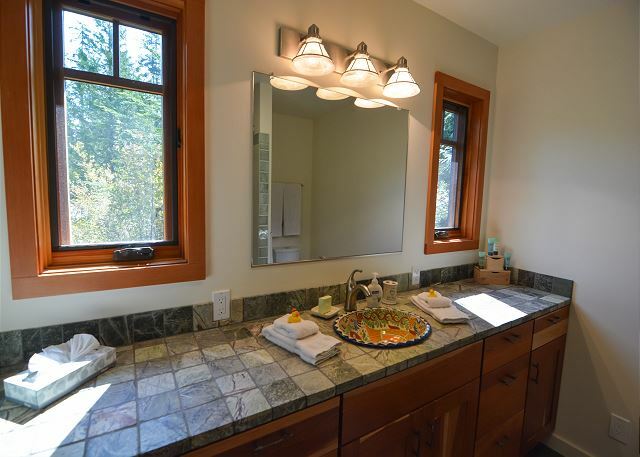 The property is lovely - and feels very private - and the house is beautifully maintained and very comfortable. Lopez Island is a wonderful place to vacation - we enjoyed the local restaurants (The Galley, The Bay Cafe, Bucky's Grill) and the beaches and trails around the island. 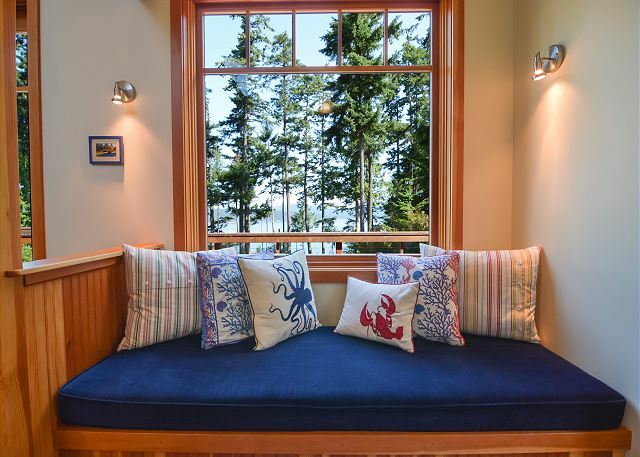 With a short drive to the ferry, it is easy to take a day trip to Orcas Island or Friday Harbor. I would highly recommend Raven Rock #318. Lovely relaxing home - great get away! 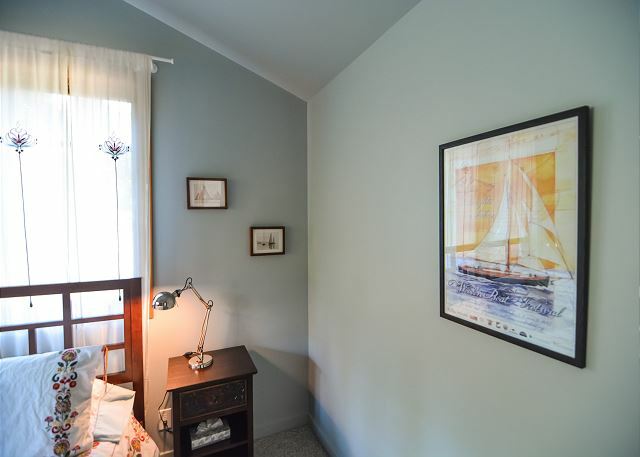 We love the location, the layout of the home, the view, and the short walk to a lovely beach. 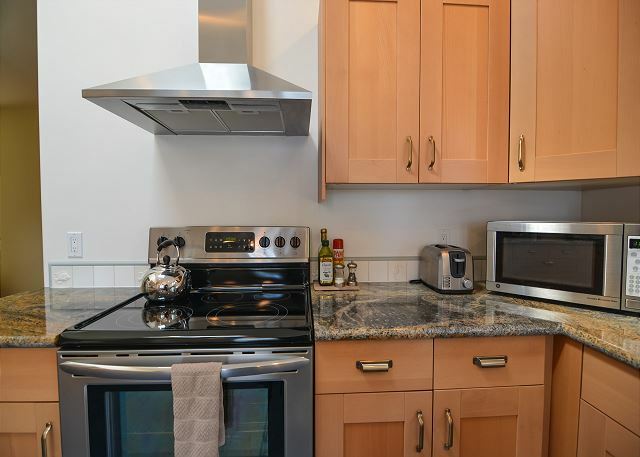 Great kitchen, comfortable furniture, and close to town or ferry. 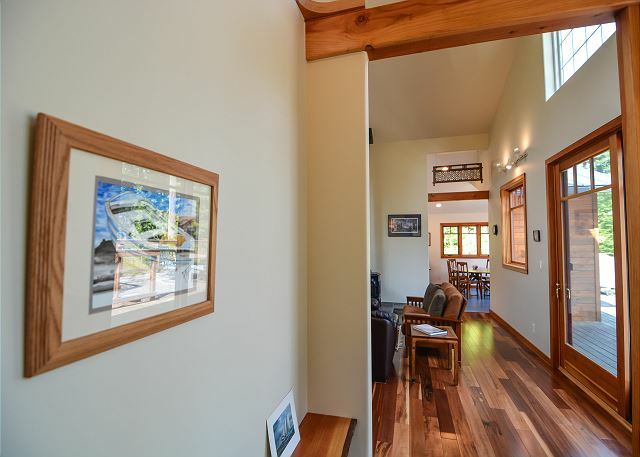 Only comment is sound/noise travels easily in the house due to the lovely wood interior! Other than that it is a great house. This was an annual girls trip with my sisters and mother. The house was a fantastic choice. 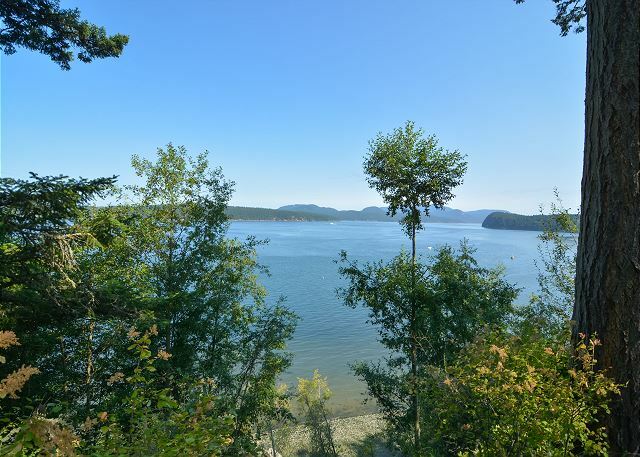 It is a beautiful location with lovely views of the water and passing ferries. The small deer that inhabit the island visited us every morning faithfully. The home was very comfortable, clean and well maintained. A side benefit we did not expect - we had good cell service at the house but nowhere else on the island!! The management company was a delight to work with. I would rent from them again in a heartbeat. Thanks again to all who contributed to our stellar experience. Raven Rock is a lovely home in a quiet location with a great view. As Lopez is a more laid back island we enjoyed cooking our meals at the house and playing games in the evening with our family. Kitchen is not as well stocked with items for cooking, good knives, pots, salad spinner etc . Also bring your own games, not even Scrabble. Easy fixes for an otherwise great house. Beautiful Home looking over the water. Home is beautiful and has everything you need. 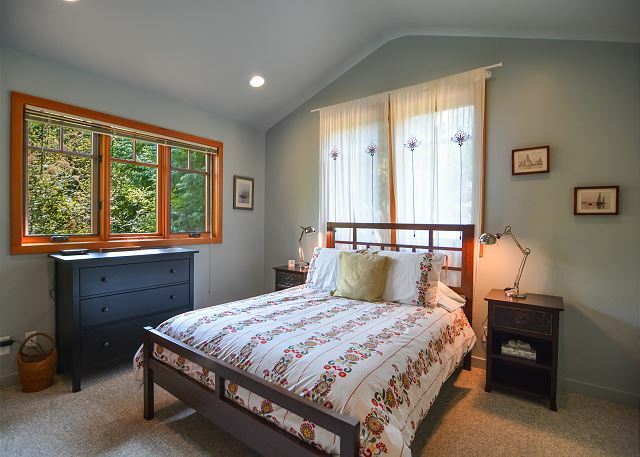 Would like window coverings on the guest bedroom as it is very bright in the morning. We biked and kayaked the island, with a day trip to moped around San Juan. Very fun. Enjoyed games (some provided, some we brought). I would stay there again. Because we had on/off rainy weather - a hot tub would have been nice. Home located close to ferry and close to the Village, so ideally located. Would go back again! This house is amazing! It was quiet, serene, and relaxing. The views are beautiful, and the house is great! 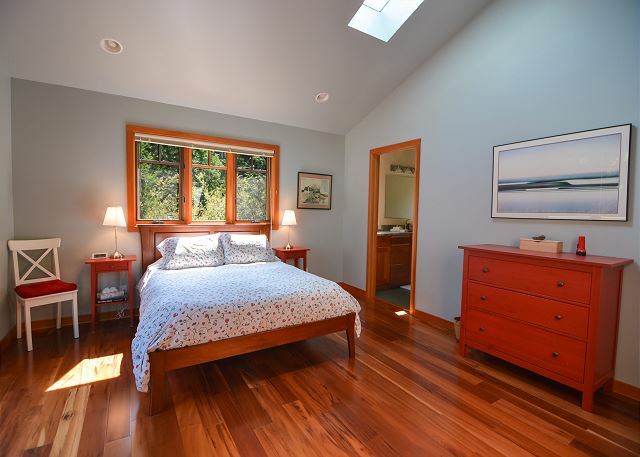 The master bedroom has beautiful views, the wood burning stove adds great ambiance, and the bathrooms are very nice. The ONLY thing I would change is the height of the deck railing. If you sit in the patio furniture, the railing hits right on the horizon and blocks the best part of your view. Not anything to die over, but it was a little annoying as you spend a lot of time looking at the beautiful views that this house offers. I would highly, highly recommend renting this house. Worth every penny. Great location near a lovely, quiet beach (Discover pass required). The only small disappointment was that one couldn't walk from the property on to the beach - it is a short car ride or bike ride, but a bit too far to just nip down on foot. A few loungers on the deck would have been appreciated. The house was in good condition, nicely appointed, clean and in a great location. What a great rental house! I have stayed all over the island and this one was one of the best (minus a hot tub). We had children and grandparents with us and the house has some echoes but has a layout conducive to privacy even with early risers. Fully stocked kitchen (though could use a brownie pan!). Very satisfied with the rental process. Such a lovely House and view! 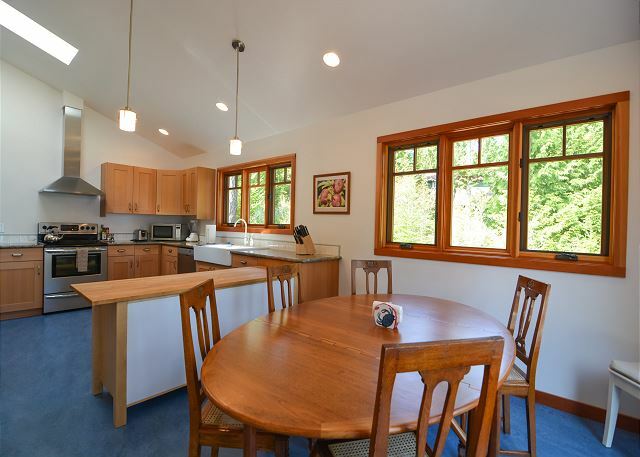 Wonderful roomy house with beautiful kitchen and large deck. WE loved it! 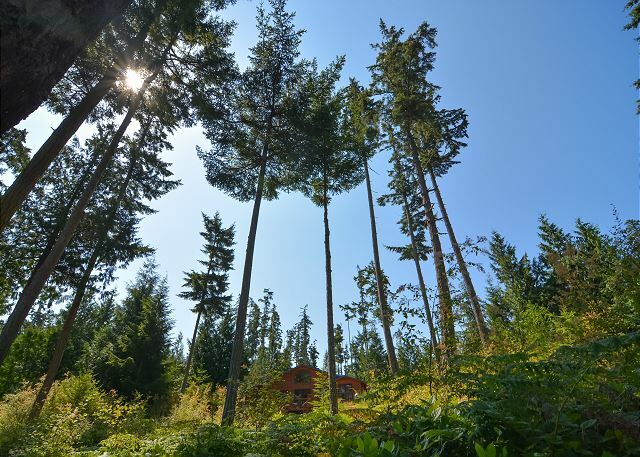 Raven Rock was a beautiful retreat on laid back Lopez Island. Clean, modern, lovely view of the water through the trees. The morning view from the master bedroom made it hard to get out of bed, but coffe on the deck made it worthwhile. 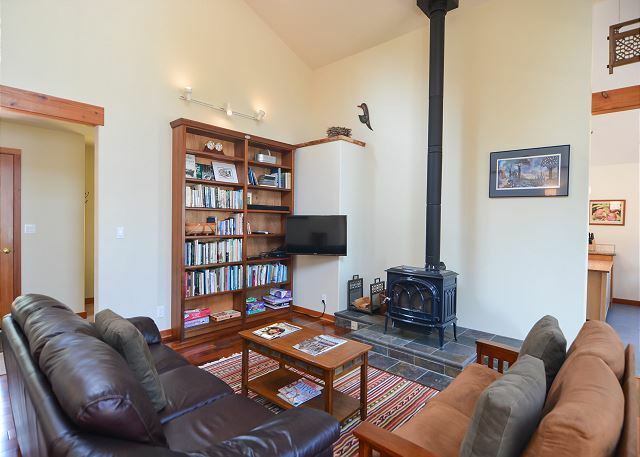 Not far from town, close to private sandy beach. We would return in a heartbeat! Beautiful home; we made some great memories around the campfire, eating seafood dinners in the kitchen, and playing games (provided) in the living room. I would highly recommend this vacation rental! We just had a lovely vacation at Raven Rock and the beautiful home surpassed our expectations. 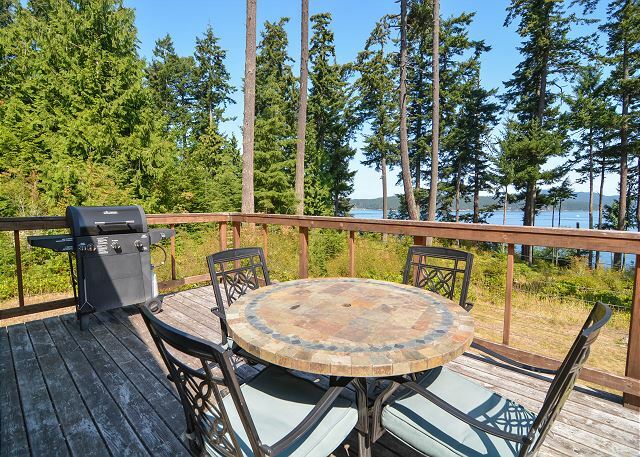 This home is tucked away on a bluff overlooking the sound. Gorgeous views in the morning over coffee or in the evening. Fun to watch the boats and ferries go by. 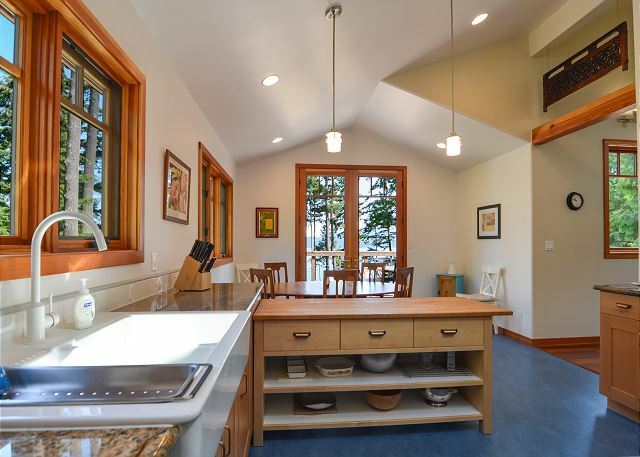 The home is beautiful inside, clean, plenty of supplies, nice kitchen. 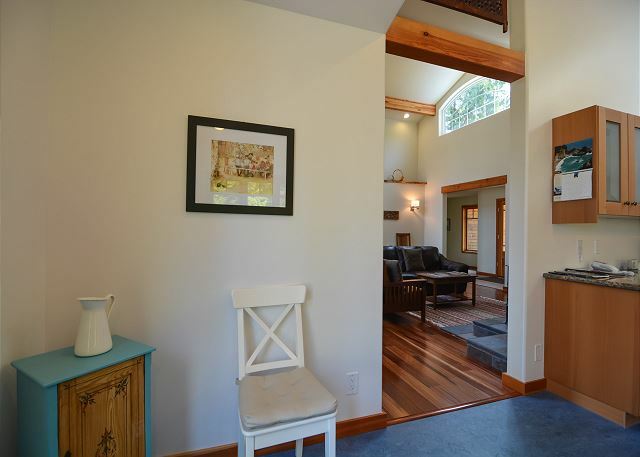 Loved the woodwork, window seat, custom tile and other nice touches. Plenty of seating inside and out and the furniture was comfortable. There is a huge deck along the back of the home and good sized yard. The small forested area made a nice barrier so we didn't have to worry about our granddaughter getting too close to the bluff. The island is peaceful and serene - it was so quiet at night! The village is fun and every restaurant we ate at was delicious. Some fun shops - books, candy, art - nice to support and have locally made products. The little museum was nice and the people everywhere are very friendly. 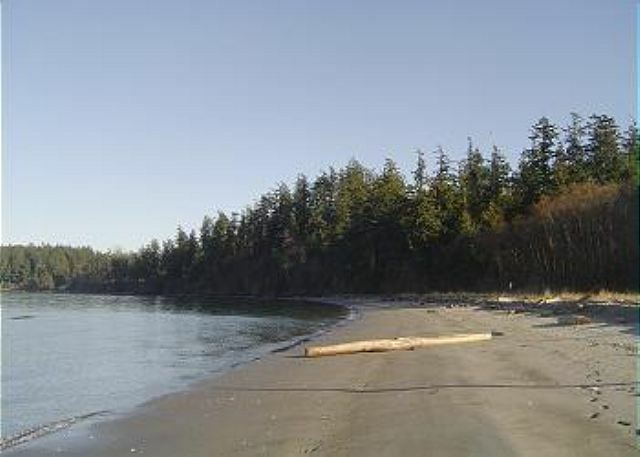 The island has over a dozen beautiful waterfront parks to enjoy, each one unique. Well worth it to go explore at least a few. There's not a lot of stuff 'to do' as far as commercial activities, but it was perfect for relaxing and enjoying the nature, wildlife and the little village was fun and provided plenty of entertainment for us. Guest rooms need a mirror in each. Need door mats (interior) at deck doorways. A beautiful new home with a great view. Very comfortable for a sister's retreat. 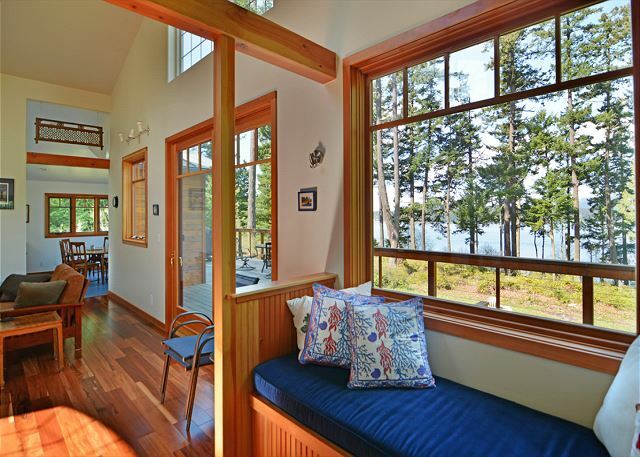 Secluded and quiet with great views of the ferry. Relaxing and well stocked and only 2miles from town, a perfect walk. Thank you for sharing your home with us! BEAUTIFUL NEW HOME WITH GREAT FURNISHING WITH A FANTISTICE LOCATION. great place to stay. access to the beach is a bit of a walk and unclear if the stairs used to get to the beach are open to this property or not. We enjoyed our stay in this lovely home. Great décor and location. Nice view and yard. Plenty of wildlife around to enjoy. I would definitely stay here again. Thank you for sharing your home. San Juan islands Birthday Bash! fantastic scenery, great for outdoorsy gatherings - whale watching, charter fishing, biking, kayaking. house is new with latest amenities, remember to wave while driving, walking,it's required!